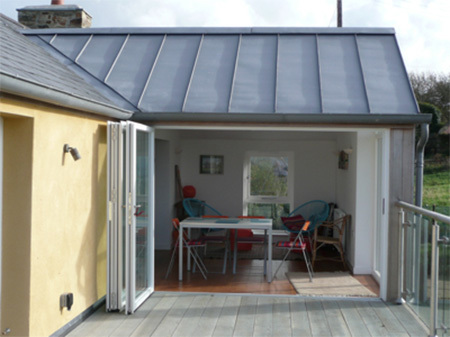 We recently repaired, altered and extended this private residence, which enjoys a lovely setting close to the Pembrokeshire coast, with fine views across St Bride’s Bay. Originally the house had been converted in the 1960s by the present owners’ parents, who had been architects: we sought to retain or reinterpret as much of their 60’s work as possible. Of personal significance to the family, it also expresses the optimism of a period that is now itself becoming history, although seldom valued enough yet to ensure that good examples will be preserved. The initial intention was to try to retain the stone built, single storey rear extension to the house, over which a terrace had been built: however, mortar analysis confirmed this part of the building had originally been used for agricultural purposes, with the walls heavily contaminated with nitrates, and other salts. The strength of the mortar was also very poor. 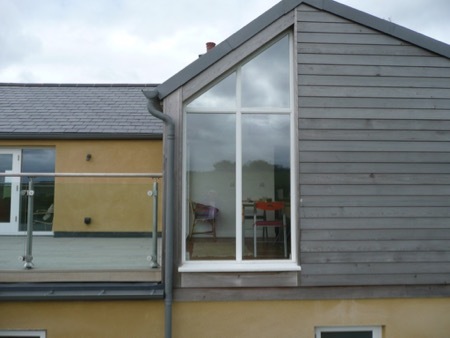 With the agreement of the Pembrokeshire Coast National Park, the extension was eventually rebuilt, opening up the possibility of greatly improving the overall thermal performance of the house. While the house still largely retains its original lime-bound stone walls, with judicious design a reasonably sustainable thermal performance has been achieved overall, including underfloor heating partially heated by solar panels. 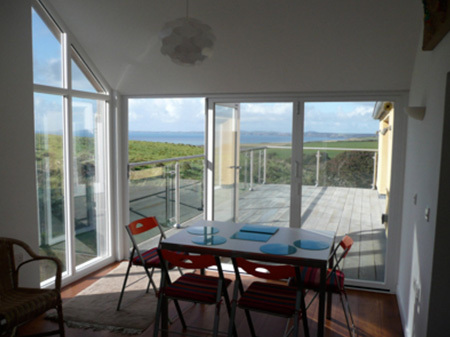 A new dining room extension opens on to the first floor terrace, and fine views towards the sea. The cedar and zinc cladding to the new extension complements the retained stone structure of the main part of the house: in a comfortable, and we believe harmonious way, the completed design brings together a Nineteenth Century stone farmhouse with some contemporary architecture, while still retaining some of its valued 1960s interior.